The Investment Treaty Forum of the British Institute of International and Comparative Law brings together eminent practitioners, arbitrators, and academics in the dynamic area of international investment law. Members of the Forum, under the British Institute's auspices, examine and debate the legal and policy issues presented by the increasingly complex web of investment treaties and the disputes that arise under them. The Forum held two conferences in 2007: the present volume compiles the papers presented at the conferences as well as a transcript of the round-table discussion on the subject of 'precedent' in international investment arbitration that featured some of the foremost authorities on the subject. 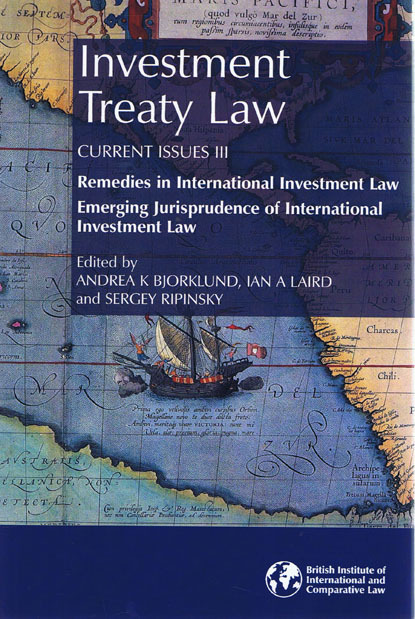 Part I of the book is devoted to remedies, compensation and valuation in international investment disputes. This under-theorized area of law is ripe for further exploration by lawyers and economists, and the papers in this volume present a framework for further inquiry. Papers in Part II address the jurisprudence emerging from investment arbitration tribunals on issues such as fair and equitable treatment, 'umbrella' clauses, and nationality of claimants. The overarching question addressed by the papers, and by the concluding roundtable, is the relationship of those decisions with general international law and whether or not there is, or should be, a doctrine of precedent in investment treaty arbitration. Purchase this book along with Investment Treaty Law Current Issues I and II for a 3-volume set price of £170. "Investment Treaty Law: Current Issues III"